A member of staff at a Mitsubishi dealership in Bilston is looking for people to take part in a fundraising event for a foodbank. 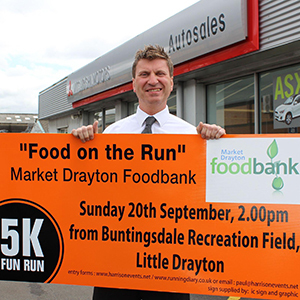 Paul Harrison is hoping 150 people will take on the Food on the Run 5km event at Buntingsdale Recreation Field, in Little Drayton, in aid of the Market Drayton Foodbank. Paul, Aftersales Manager at Autosales Mitsubishi in Vulcan Road, decided to organise the fundraiser after seeing the rise in people turning to foodbanks. This is not the first fundraiser Paul has organised. In 2014 he put on the Silly Vicar fun run, with 130 people taking part, which raised £850 that was divided between Market Drayton Foodbank and Christ Church in Little Drayton. This year’s event, which takes place on September 20th, will also include a bouncy castle and face painting for children and a display of vintage cars and motorbikes. Market Drayton’s Gold Radio will be broadcasting live from the event and there will be prizes of Glofaster sports clothing on offer, including one for the best fancy dress costume. Helen McSherry, manager of Market Drayton Foodbank, said: ‘We get a lot of food donations, which is excellent, but donations of money like this are really, really important because we have ongoing monthly bills such as rent, electric and telephone to pay.